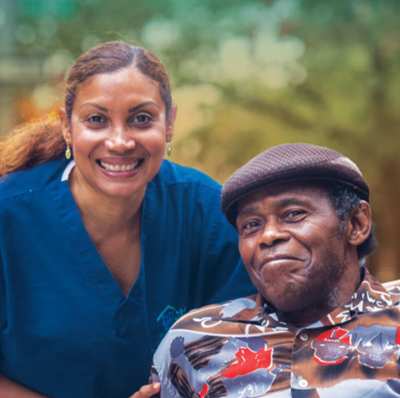 PHI’s Care Connections project (CCP) created an advanced role for home care workers that was designed to maximize the value of home care in improving care transitions, with the goal of reducing emergency room usage and preventing rehospitalizations. With lead funding from the New York State Department of Health, we designed the project and then rolled it out towards the end of 2014; it included an advanced home care training curriculum, the training of 14 home care workers, and the deployment of eight full-time “Care Connections Senior Aides” among three New York licensed home care agencies. In its first 18 months, CCP benefited more than 1,400 members of Independence Care System (ICS), the project’s participating managed long-term care plan. While additional evaluation is needed, preliminary project outcomes show improvements in the rates of preventable hospitalizations, ER visits, and medication adherence. The project also helped reduce family caregiver strain. The project’s partners have been able to support the continuation of this project beyond the initial funding phase. PHI has also turned its attention to expanding the project’s impact to cities and states around the country. In 2017, PHI partnered with WorkingNation to release a short film on Care Connections.